Custom printed Gourmet Bags are a new sleek and attractive alternative to the everyday food packaging bag. This two-ply food service bag is a creative new way to keep your sweet treats, cupcakes, nuts, candy, breads and other food items fresh. Show off your style by packaging your food items in this colorful custom printed Gourmet Bag. Have a log or design to add to your bags presentation? No problem! Our skilled design team can transform images and screen our images for added brand recognition. Beverage napkins, paper linen napkins, handle shopping bags, to go boxes, plate liners and so much more. Anything you’re looking for to draw brand attention with food packing supplies we have! A new sleek and attractive alternative to the everyday food packaging bag. Food packing supplies to dress up your businesses style. Review our easy to navigate website and read all the specifics on each product in our packing supply line. Learn about our custom color print technology and how we can apply your logo to all your food service products. 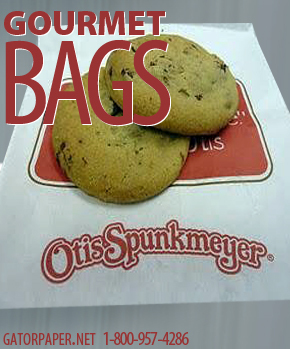 The custom printed Gourmet bags are available in white and a variety of solid colors. We know you will love these bags!